Love a good do-it-yourself project? DIY projects can be a simple and fun way to spruce up your bathroom without breaking the bank. Updating your bathroom with a sleek new bathroom vanity and cabinets from Strasser Woodenworks is step one, then complete your look with a few added, simple touches. These easy DIY projects can help elevate your bathroom and make it your own, personal dream spa! Pick up inexpensive frames from second-hand stores, and fill them with pages from old garden catalogs or books. Hang them in groupings in the bath for a gorgeous accent. Hanging inexpensive, easily replaceable art in the bathroom reduces any stress of potential water damage. Mirrors not only serve a functional purpose, but they can add light and help make a small room feel more open and expansive. Creative uses of mirrors can help turn an ordinary space into something unique. Grouped mirrors, hanging mirrors or even framing a simple mirror can bring new life to your bathroom. Use glass paints and faux leading strips to create a stained glass look on that plain bathroom mirror, or add wood trim around the edges of the mirror to frame it. Update your bathroom wall colors with something new and exciting! Try a daring color combination or a theme room you love but wouldn’t use in another space. Try rich jewel tones or calming pastels, whatever fits your theme. Thick, luxurious bath towels that complement your new wall colors will add to that “spa” feeling. Or, breathe new life into your old bath towels by stitching an easy and quick edging to them with pretty fabric. It takes just a small amount and some simple hemming to add unique custom details to your bath. Molding and trim go a long way in making your home look and feel more custom and expensive, but can be pricey. To get the look without the extra added cost, boost your baseboards by adding a slim piece of trim a few inches above your baseboards, and then paint in between. 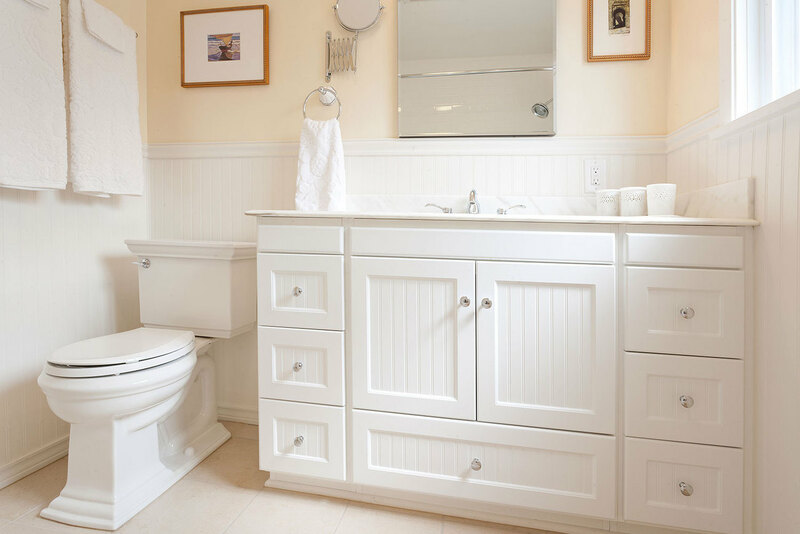 If you haven’t already updated your bathroom cabinets and vanity, contact Strasser Woodenworks to get the perfect bathroom you’ve always wanted.